While Samsung would like to think that the official launch date of Android 7.0 Nougat for its Galaxy S7 and S7 Edge was January 17, the update barely made it to a handful devices on the proposed date. More than a month later, Samsung Nougat update is hitting the flagship devices in Indonesia. 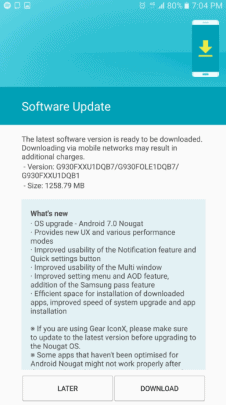 Moreover, the Nougat 7.0 update has finally been deployed in European regions such as Germany, Belgium, and the Netherlands, which is among Samsung’s chief markets. Weighing in at 1.3GB as expected, the latest software update brings a slew of bug fixes along with the goodness of Nougat. While the current batch of the update is regarding the factory unlocked international version of the Galaxy S7 and S7 Edge, not all devices in the region are receiving the update. For instance, some European network carriers have updated the two devices in regions such as the Netherlands weeks ago, while other operators are still preparing the launch of their version of the Nougat update. Are you among the lucky Galaxy S7 and S7 Edge users who have received the Android 7.0 Nougat update already? Do share your thoughts on the new software version in the comments section down below. You can also go ahead and update your device manually by heading over to Settings->Software Update-> Software manual download.